(Bloomberg) -- Reserve Bank of India Governor Urjit Patel signaled that Wednesday’s interest-rate hike was not aimed at defending the rupee. Analysts say that the move will still provide the much-needed support to the currency. For HSBC Holdings Plc and Nomura Holdings Inc., it bolsters the RBI’s credentials on the inflation-fighting front, which they say will have a rub-off effect on the rupee. Morgan Stanley says it has turned tactically bullish on the currency following the first increase in the benchmark rate since 2014. India’s restrictions on overseas investment in its bond market mean that the link between higher rates and the currency isn’t as strong as in Indonesia and the Philippines, where central banks have tightened policy in a bid to support their exchange rates. Historically, India has seen more inflows into its equity markets, which respond positively to rate cuts. That said, the rate hike “provides comfort to international investors” in terms of the RBI’s inflation-fighting credentials and “to that extent, it would have a positive sentimental impact for the rupee,” according to Pradeep Khanna, HSBC’s head of global markets trading for India in Mumbai. Coinciding with a drop in crude oil prices and the global dollar index, the move could help the rupee consolidate between 66.50 to 68 to the greenback over the next few months, he said. The rupee snapped a two-day drop and ended 0.3 percent stronger following the RBI’s decision on Wednesday. It fell 0.2 percent to 67.08 per dollar on Thursday, taking its decline in 2018 to 4.8 percent. 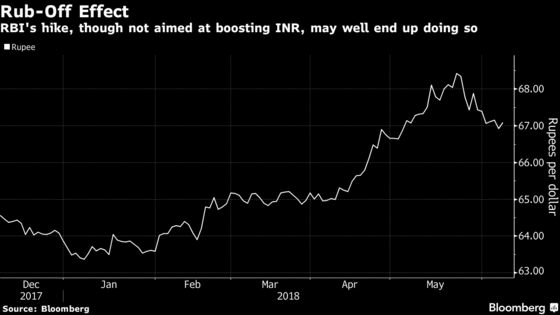 “The RBI’s rate hike will help strengthen monetary-policy credibility, especially given the relatively strong growth, some pockets of higher inflation and the recent sell-off in local markets,” Nomura analysts including Sonal Varma wrote in a report. The Japanese brokerage firm maintained its long rupee position via a one-month dollar put/rupee call option. Morgan Stanley recommends selling one-month dollar-rupee non-deliverable forwards, targeting a reversal back to the 65 level, analysts including Hong Kong-based Derrick Kam wrote in a report.